I have not been very craft inspired these past couple of weeks, so I was making my way though some crafty type videos for ideas when I found THIS :). THIS is a fun technique video using dryer sheets. I challenged my sister Barb and my sister in-law Judy to learn this technique with me. As with any new technique it ran me through the hoops :). My first hiccup was using Easy Tack repositionable adhesive rather than something a little more permanent, I needed to add some glue to stop the dryer sheet from ... re positioning :). Then there is the glitter, always fun in my hands... my husband is quite fascinated that there is sparkles all the way down to the garage, and he is still not sure if he likes glittered garbage cans and recycle bins. Anyway.. I sprayed the easy tack, laid down the dryer sheet then added the glitter. I let this dry then tapped of off the extra glitter, I went one step further and gave the panels a quick spray of sealer. 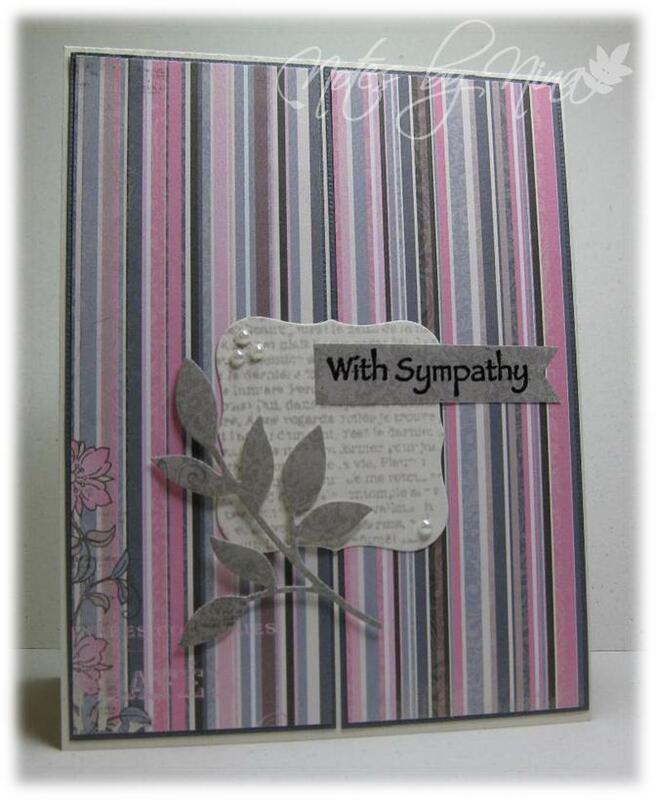 I heat embossed the sentiment, added the flourish and finished with a wide sheer ribbon. 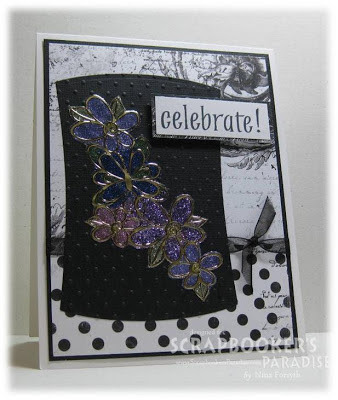 I love the texture, and all the fun sparkle, here is a close up picture. 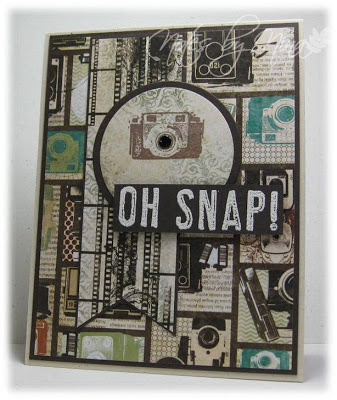 Please stop by Barb and Judy's blogs to see what they have created using this same technique. Supplies: Natural White and black card stock, Designer Paper-Authentique, Technique Tuesday-Stems, ribbon, glitter. I would like to try this technique with a winter scene, I will wait though until glitter no longer makes its presence known.. everywhere. Although it is fun to see the odd bits of glitter decorating my honey's face now and again. 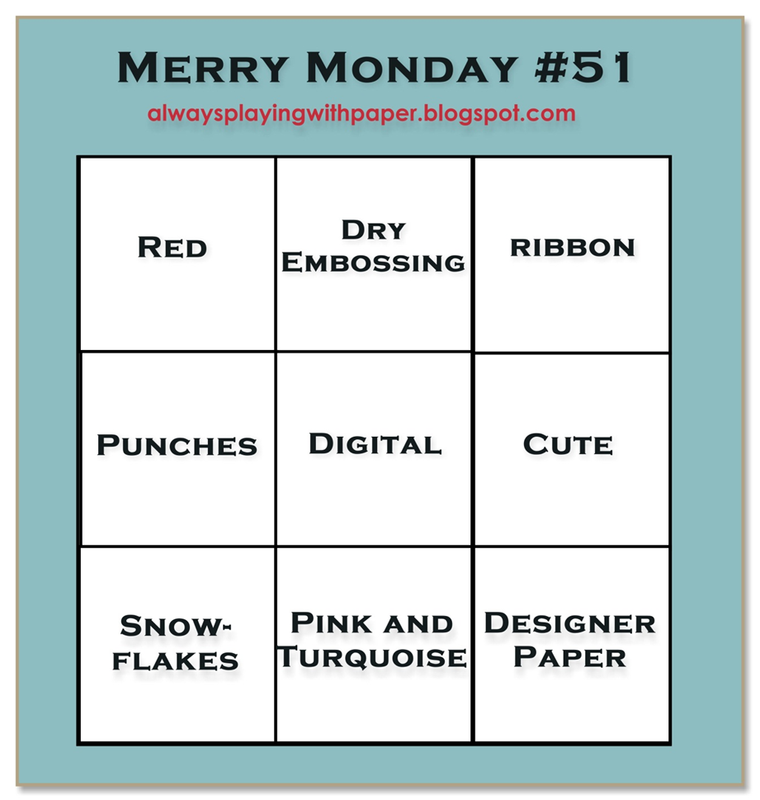 Welcome to a brand new Merry Monday challenge, we have a Tic Tac Toe to inspire us this week. I went down the right side, Ribbon (check), Cute (definitely) and Designer Paper (of course). This card forced me to admit my eyes just may be getting a little tired as I get older. By the time I coloured these adorable little guys and cut them out my eyes were definitely done. So I found this fabulous craft magnifier that clips to my desk and works like magic. The snowmen are coloured and fussy cut then backed by a textured circle and popped up with foam tape. I added ribbon and the sentiment to finish. 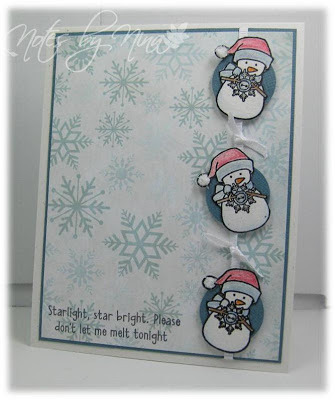 Supplies: Natural White and turquoise card stock, Designer Paper-We R Memory Keepers, There she goes Stamps - Snow Buddies and Snowman sentiments, ribbon. 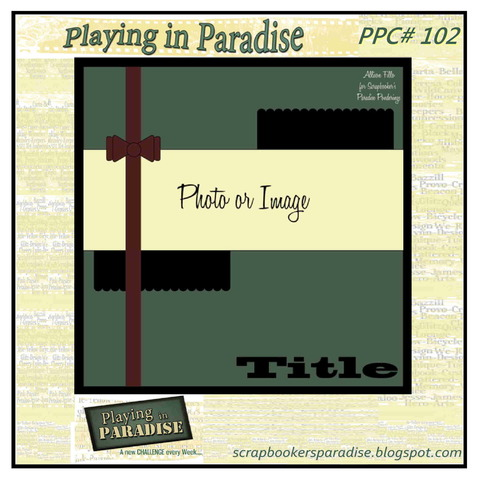 Happy Friday, It is time for another Playing in Paradise challenge and I am hostess this week. I chose Travel as the theme this week. I tried to us my ribbon straighter to iron out the paper a little and it ripped.. yup. So instead of starting over I just inking the torn edges and glued it back together. Despite my mishaps It actually turned out great. 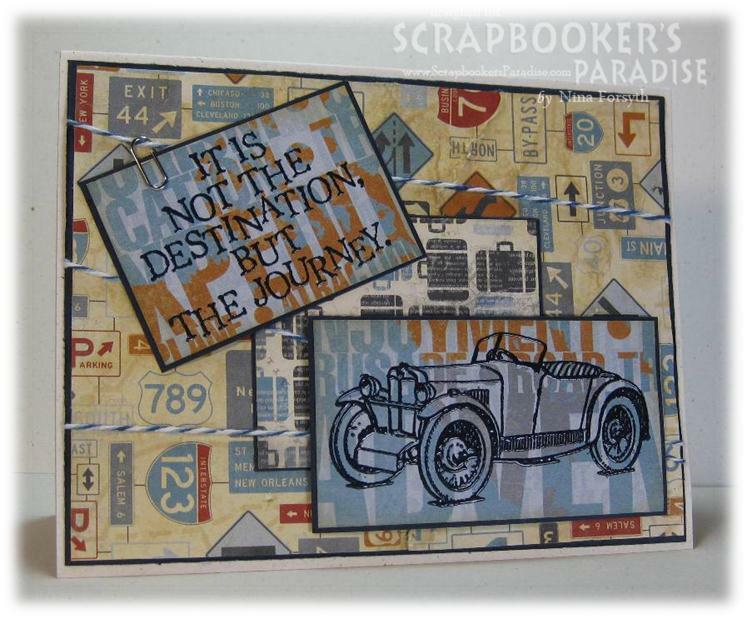 I heat embossed the sentiment and car, then added some twine and the center panel. I used foam tape to pop up the car and added a mini paper clip to the sentiment. I had intended to add Happy Birthday as a sentiment on the inside but my husband snagged the card as a Retirement card for a co-worker. Stop by the Playing in Paradise blog to see what the challenge team has created and we hope you play along. Supplies: Natural White and navy card stock, Designer Paper-Bo Bunny, Inkadinkado-Journey,The Old Island Stamp company-1929 MG Midget, twine, mini paperclip. I had a chance to spend a little time in my craft area last night so I created a card for this week’s Muse Challenge. 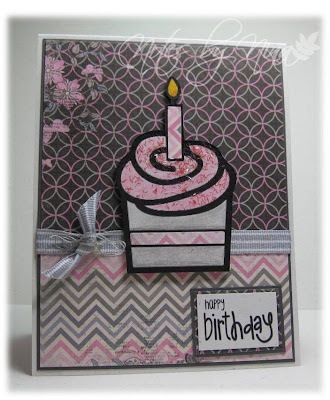 I love the bright fun colours and fabulous design on the washi tape on Marion’s inspiration card. I shuffled through my stash of 6x6 paper pads to find a DP that inspired me. I usually have an idea in my before I start my card but this one was definitely step by step but I am happy with the results. I don’t have any washi tape so I used designer paper, I cut along the patterns of the chevrons of the paper so that I could have three separate panels with lightly inked edges. I popped the die cut balloons and sentiment up with foam tape and I used the sentiment to keep the twine from the balloons in place. Supplies: Cream and brown card stock, Designer Paper-Echo Park, My Favorite Things-On the Line, The Stamps of Life-baloons2cut, twine. This weekend disappeared way too fast, I am not ready for a new week just yet. Alas I guess it is unavoidable and will arrive whether I am ready or not :). We have a new Merry Monday challenge for you. 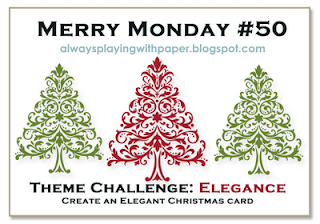 This week the challenge is all about Elegance. This stamp set has always looked elegant to me, and it is probably why I brought it. I love the pretty swirls and flourishes. 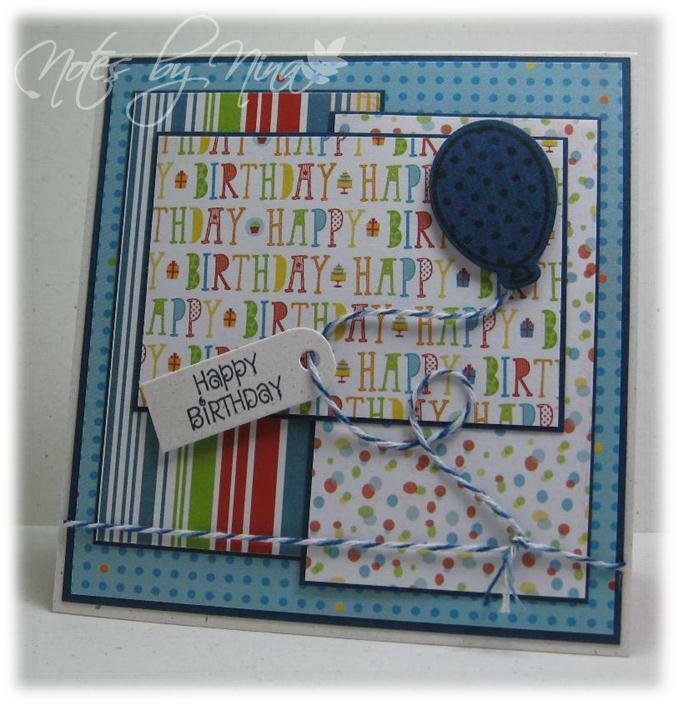 I started my card with some background texture then added some ribbon. I have had these little snowflake buttons waiting in my stash for as long as I can remember. 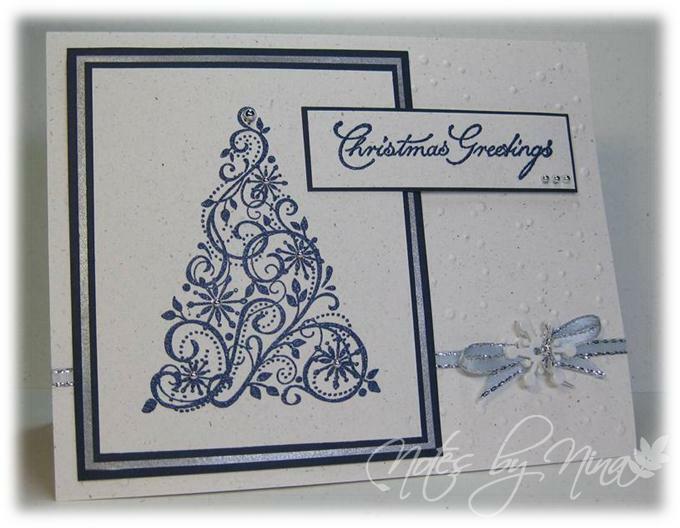 I heat embossed the tree and sentiment in dark blue and finished with some silver half pearls. 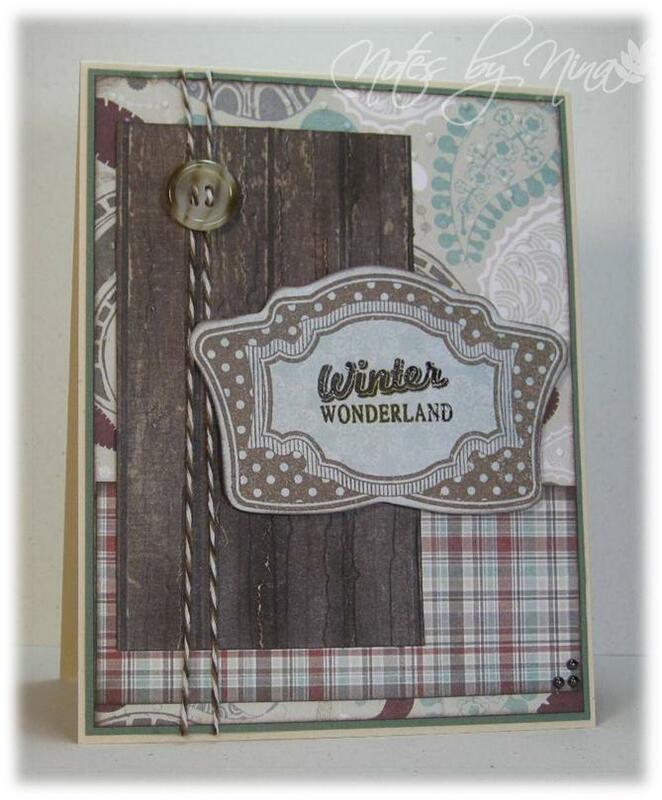 Supplies: Natural white, silver and navy card stock, Stampin' Up!-Snow Swirled,Cornish Heritage Farms-Vintage Christmas, misc ribbon, Dress it up buttons, Recollection pearls, silver twine. Don't forget to stop by Lesley's Always Playing with Paper to see what the design team has created. It will be worth the visit. I am squeezing in a super quick post for Cas(E) this Sketch! before I am off to watch the Walking Dead :). I love the design on the corner of this DP and built on that. The leave are from a Sizzix die cut and I added a sentiment and rose. The edges of the DP and the sentiment are lightly inked with Memento Rich Cocoa. 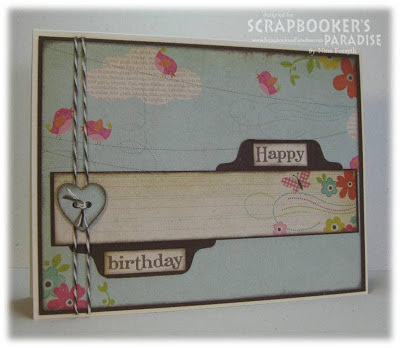 Supplies: Cream and brown card stock, Designer Paper-Bo Bunny, Verve-Birthday Phrases, Sizzix die cuts, Prima flower. Happy Friday everybody, this week seemed to have zoomed on by. It is time for a new Playing in Paradise challenge. Linda is our hostess this week and she is having us add some sparkle to our creations. I felt pretty brave when I started this card, glitter and I are not always on the same path. I wanted it to go in one specific location and it wants to go everywhere, on the floor, floating in the air, maybe a side trip to the kitchen. In the end I was able to get enough of the sparkly little bits onto my project. I affixed peel-off flowers to a piece of glue tape then added the glitter. I then fussy cut the flowers out, I wanted the vibrant colours to pop again the black background. My camera was a little confused by all the sparkle and could not pick up the beautiful glitter colours very well. 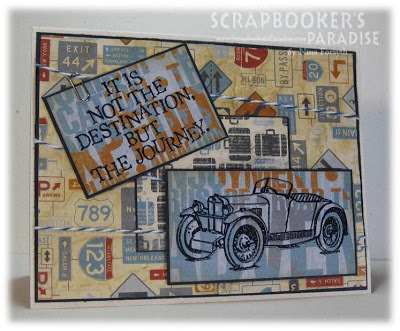 Stop by the Scrapbooker's Paradise blog and see the fabulous projects from the Playing in Paradise design team members. Join in the fun and you could win some fabulous craft prizes. 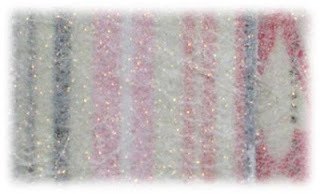 Check the Scrapbooker's Paradise online store for the wonderful selection of glitters and peel-offs. 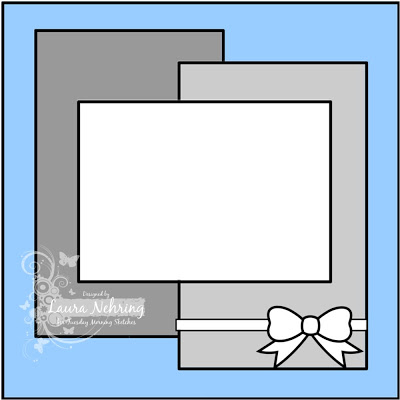 Supplies: Natural white and black card stock, Designer Paper-Bo Bunny Peel-off Flowers, The Stamps of Life-Cake2build, embossing folder, misc glitter. 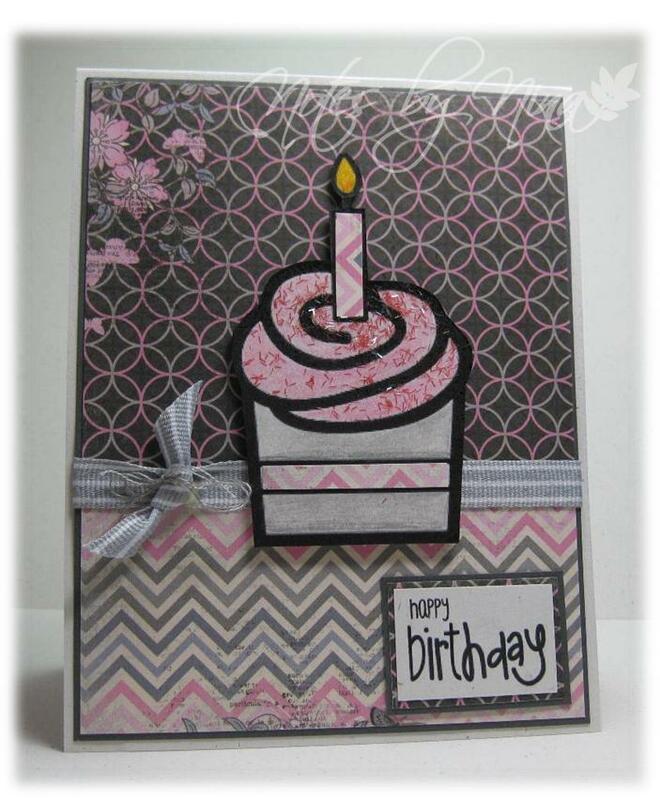 Birthday cards seem to be going out the door as fast as I can make them. Which is why I love this challenge. I have to admit, cards seem to be made a little easier when there is inspiration to work from. 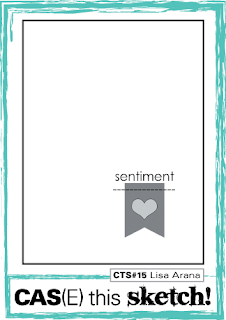 There is a new Seize the Birthday challenge posted, this week we are to make a masculine card from the sketch. 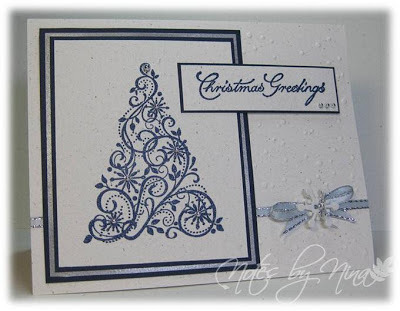 I started with a dark blue layer, then used these fabulous papers. I added circles in different sizes offset for my any shape. The sentiment is heat embossed in navy. I added a strip of navy then added twine a button to finish. 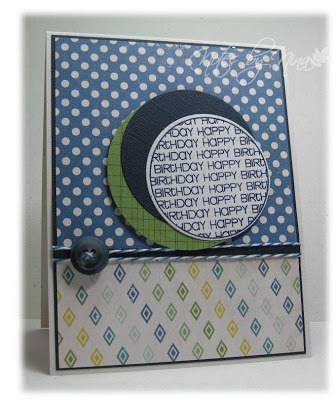 Supplies: Natural white and navy card stock, Designer Paper-Echo Park, The Stamps of Life-sentiments4circles, Spellbinders die cuts, twine, misc button. I decided to create a birthday card for the new Tuesday Morning Sketches. This week's sketch had lots of fabulous layers. I did not go Lovey Dovey though which puts in in for the Judged Challenge and I am ok with that :). I created a smaller square card for this sketch. 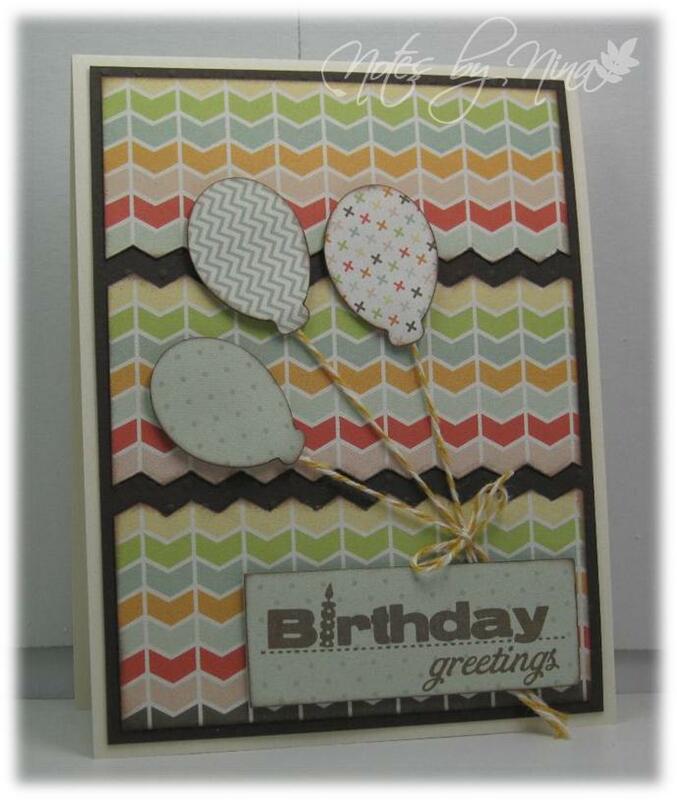 I cracked open a brand new 6x6 Bo Bunny paper pack, I love the fun bright colours. I used a dark blue for the background and used the same paper for the balloon. The sentiment is popped up with foam tape and I looped the twine around the card before tying it off. 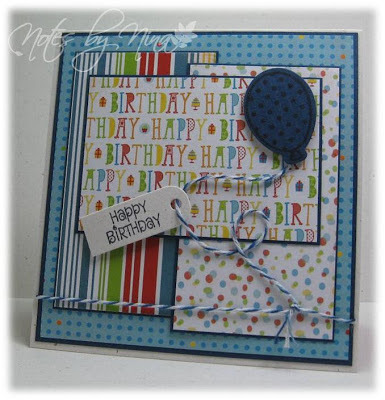 Supplies: Natural white and navy card stock, Designer Paper-Bo Bunny, The Stamps of Life-minis4circles & ballons, Sizzix die cut, twine. I am loving the time I am getting in my craft area, happy creating is always wonderful. 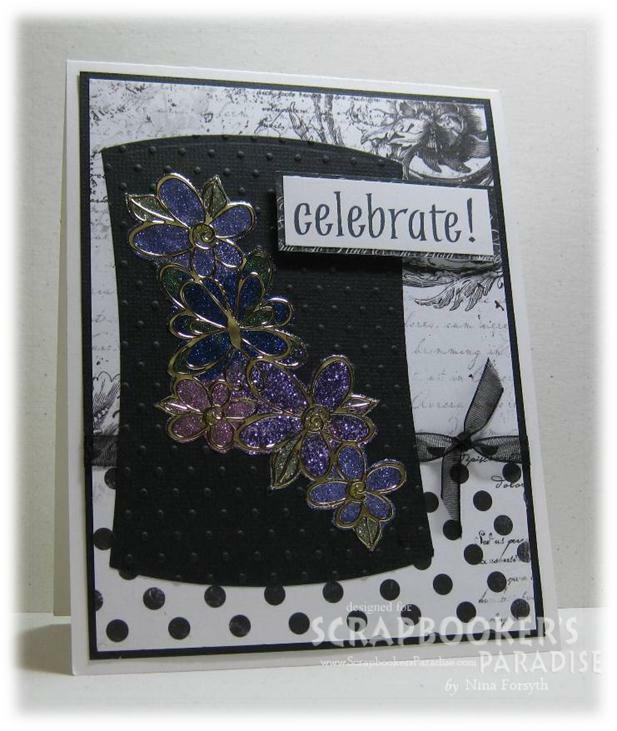 I think I am cutting it pretty close with the Inspiration Challenge at Inspired by Stamping. 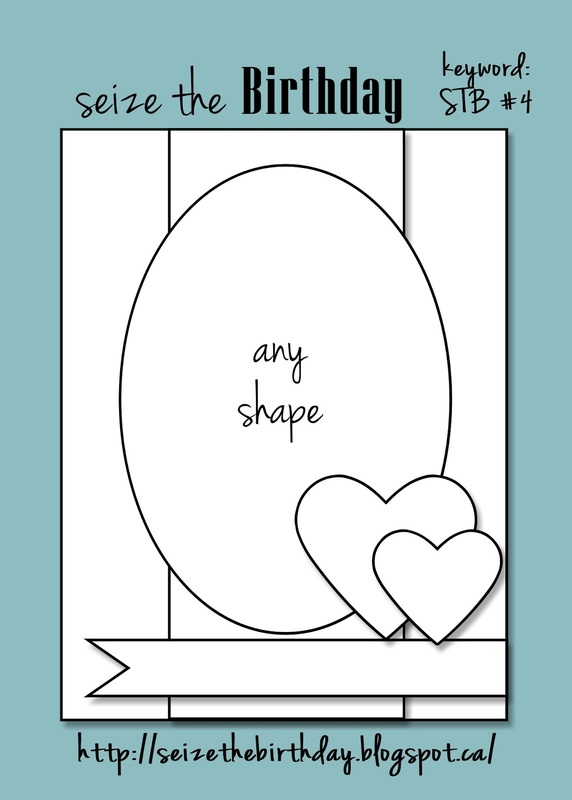 I created this simple Valentine's for my son, I did not want it to be 'sappy'. 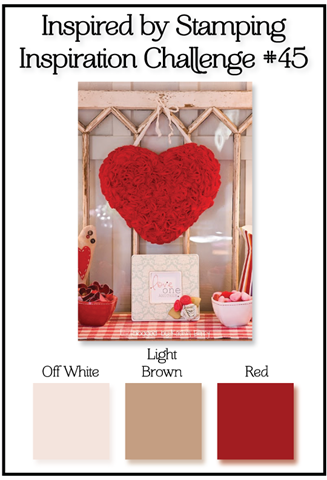 The Designer paper is a wonderful mix of deep red, cream, tan. The heart are die cut from paper with green, tan and cream. I edges are lightly inked with black. 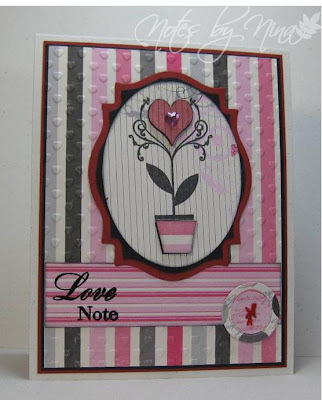 The hearts are popped up with foam tape, the sentiment was heat embossed in black. I have little spots of glue holding the twine in it's winding pattern. 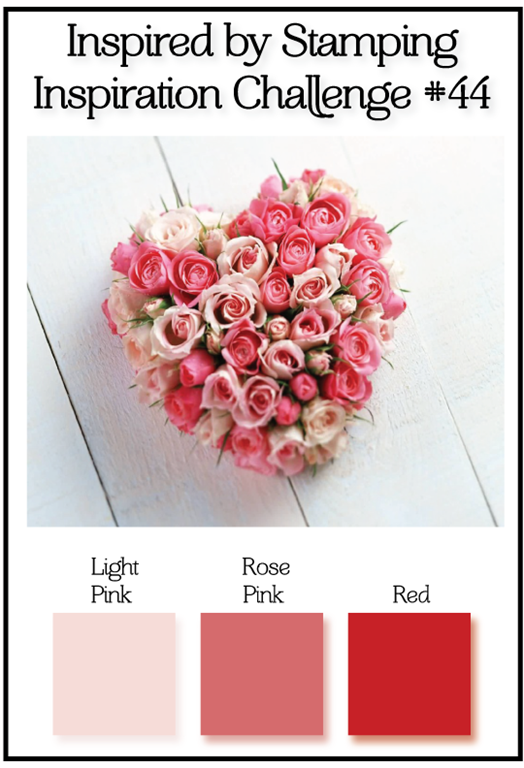 My colours are not as bright and pretty as the Inspiration picture but I was aiming for a masculine focused card. 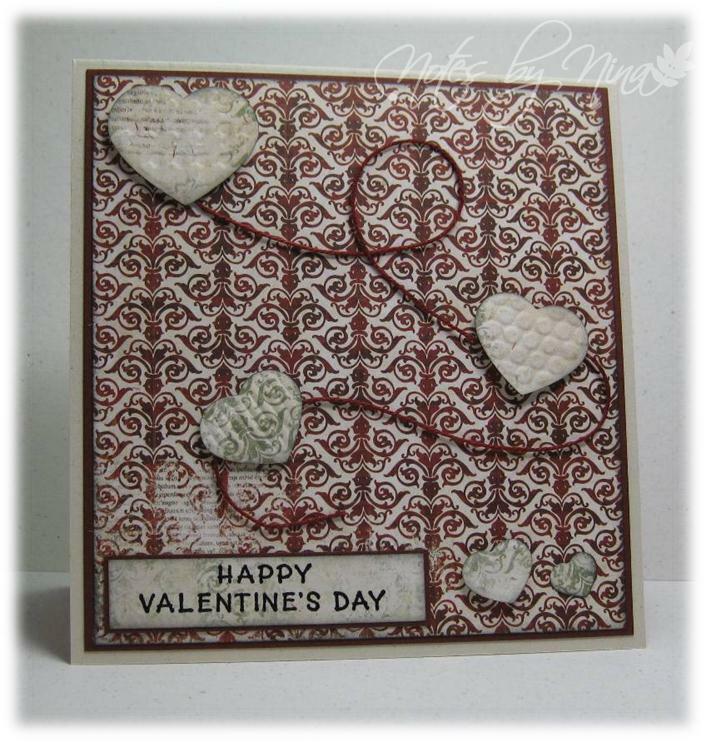 Supplies: Natural white and cranberry card stock, Designer Paper-Bo Bunny, Stampendous-Simple Valentines, twine, Sizzix Embosslets. I could not wait to create a card for the new Muse Challenge, this weeks Monday Muse is Therese Calvird. 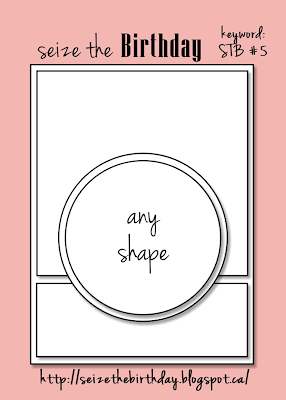 I love the simple design of her card but also really like the inspirational sentiment. 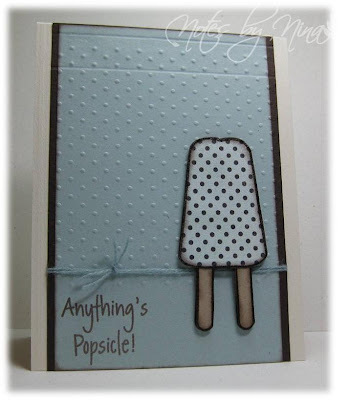 I layered the card stock then added some texture, I heat embossed the popsicle twice then fussy cut them before popping them up with foam tape. I finished with some twine and the sentiment. 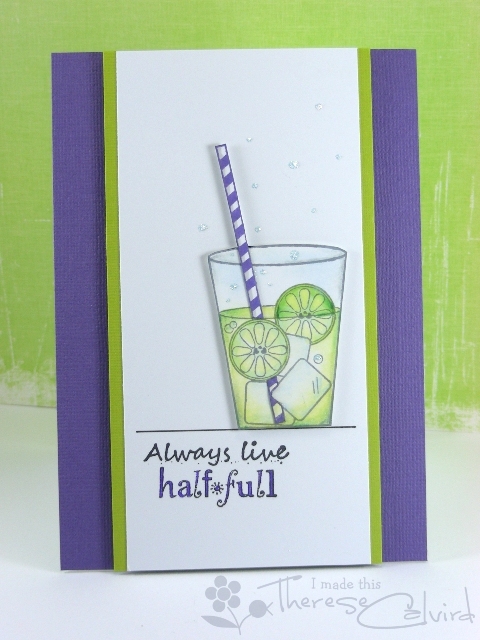 I added in a few embossed lines to cover the imprint left by the embossing folder. 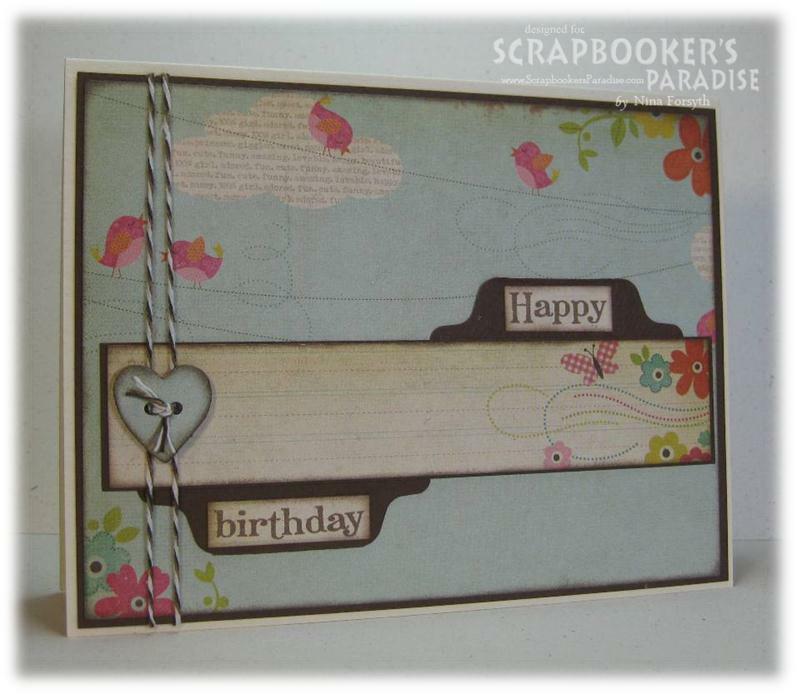 Supplies: Cream and eggshell card stock, Designer Paper- Authentique, The Stamps of Life-pops2eat twine, embossing folder. 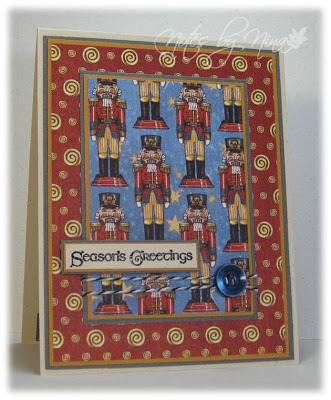 A quick second post for today, I had card making time planned yesterday however my husband happy clicked our computer into nasty virus infection that had me working to fix it for the majority of the day. All is good now, and I was able to spend some time today trying to squeak in under the wire for a couple of card challenges. The first one is Seize the Birthday. I printed off a couple of the freebie digital stamps from The Alley Way Stamps website. I fussy cut the cupcake and popped it up with foam tape, then coloured it with my Irojiten pencils. I added some sparkle to the flame with my Spica markers and even added a little glitter to the icing. I added some ribbon and a bow, then finished with the sentiment. Supplies: Natural white and gray card stock, Designer Paper-Bo Bunny, The Alley Way Stamps-Digital Stamps, ribbon, embroidery thread, glitter. Happy Monday everyone, I am enjoying a Sat holiday here in BC today. I love long weekends :). It is time for a new Merry Monday, this weeks challenge is a fabulous sketch created by the very talented Lesley. I inked up my new JustRite Vintage Label stamp too, I fussy cut the shape out as I don't have that die cut... yet. I added some texture to a couple of the layers and then finished with twine , pearls and a button. Supplies: Natural Ivory and mint card stock, Designer Paper –Fancy Pants, JustRite-Christmas Vintage Labels One, twine, button, Recollections-Pearls. Please visit Lesley's Always Playing with Paper to see what the design team has created. I am having a wonderful quiet Saturday, a quick visit to a local Scrapbook store, lunch out and now a little card making.. I wanted to get a quick card done for this week's Tuesday Morning Sketches. I cracked open my new 6x6 Bo Bunny paper pad, sigh.. heaven :). I just had to get the matching stamps too. The papers blend so well that the layers almost hide in the pattern. 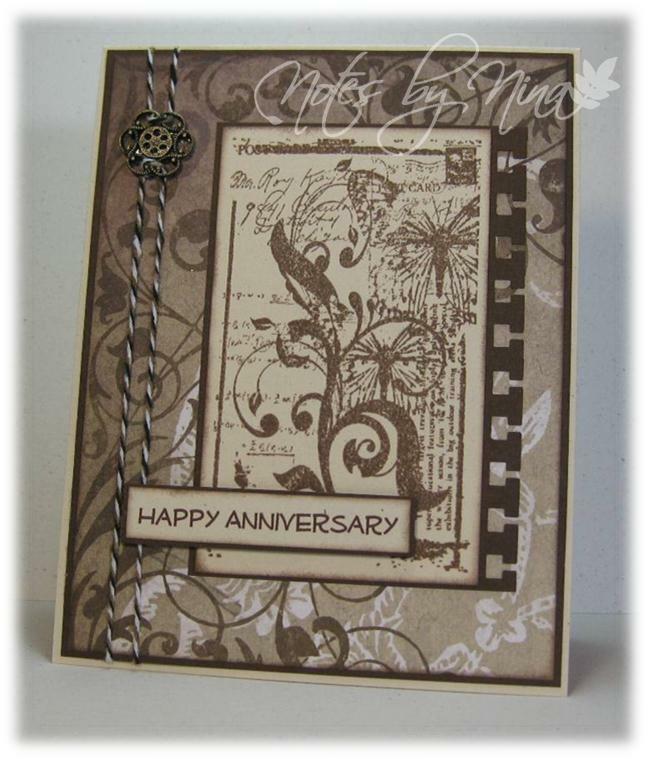 I used Spellbinders for the circles and stamped the camera in Memento Rich Cocoa. 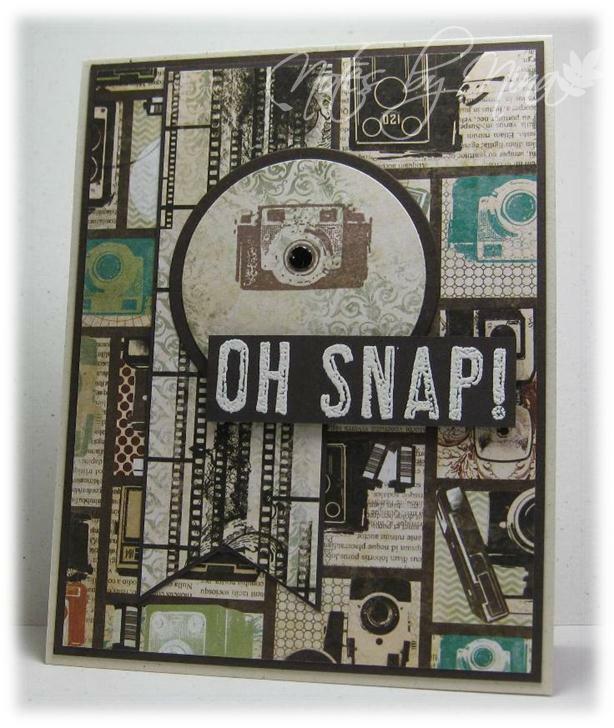 The sentiment is heat embossed in cream and I finished with a Hero Arts Black metal decor for the camera lense. 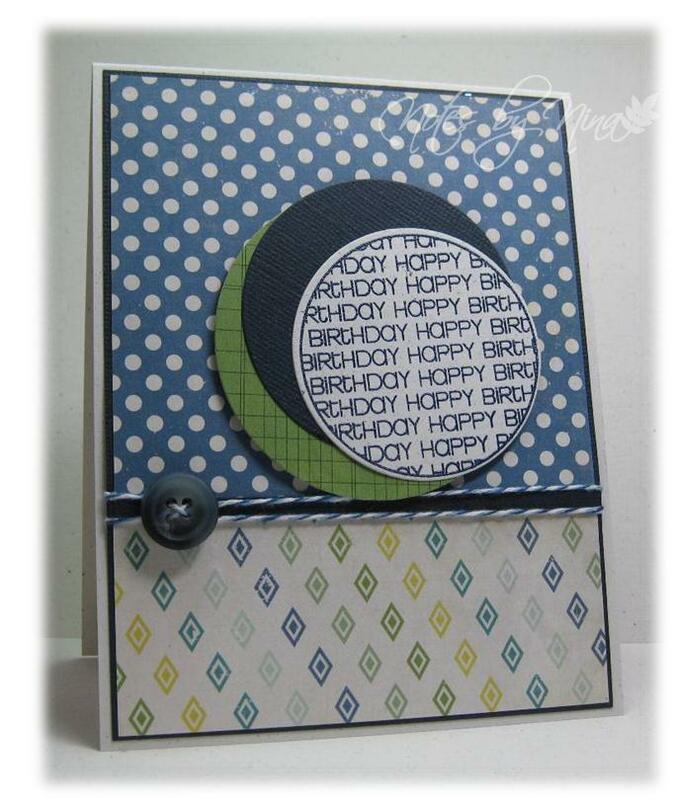 Supplies: Cream and brown card stock, Designer Paper& Stamps-Bo Bunny, Spellbinders, Hero Arts embellishment. 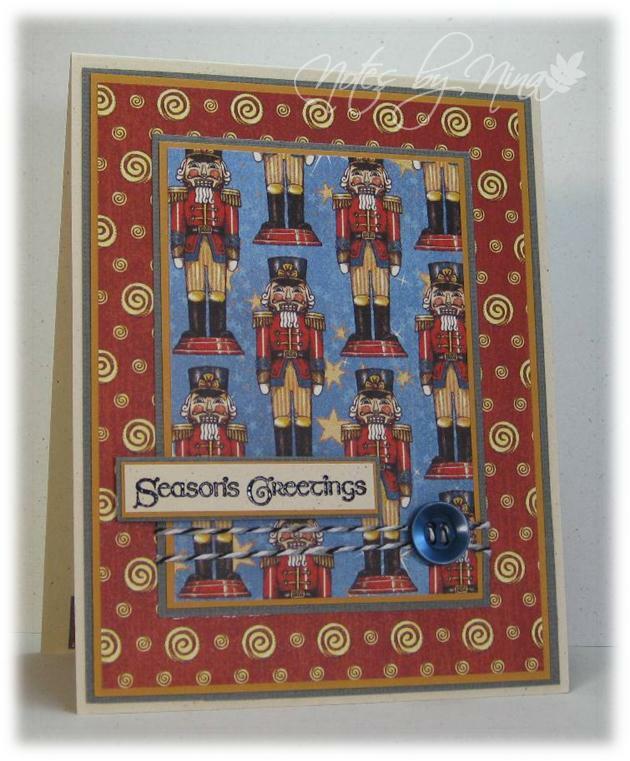 I found a little bit of a second wind to create this card, I am starting to droop though so I will make this short. 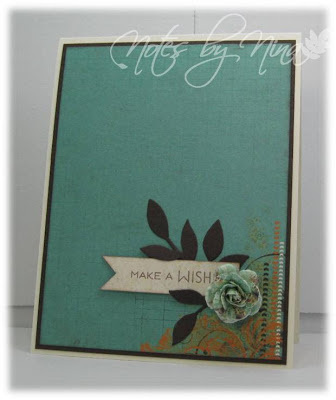 Another new challenge for me tonight, this one is Muse Challenge #3. I am going to ask that you follow the link to see what this challenge is all about ;). My interpretation of the Muse inpiration card by Laurie Willison was to view it as a sketch, I loved the layered panels. The photo is not as bright as I would like, that what I get for taking photos at 9pm. I layers the two background panels. 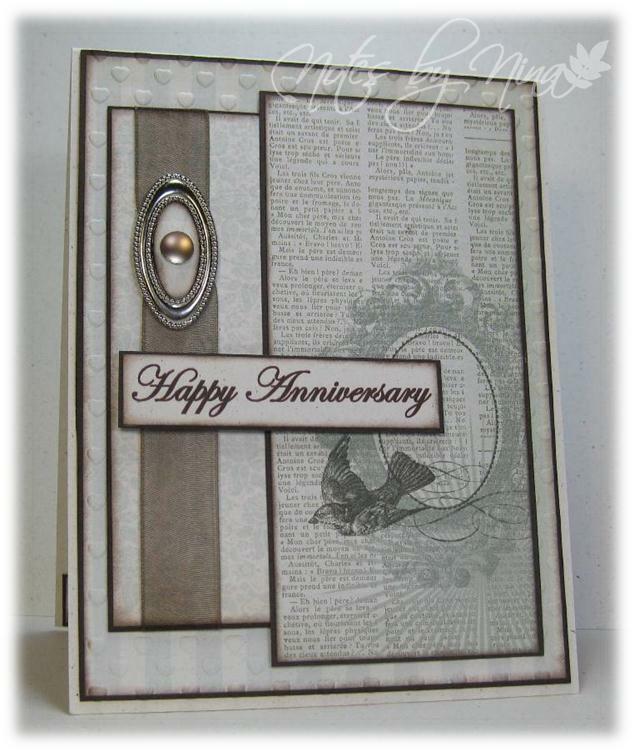 I added a couple of die cuts and finished with the sentiment and pearls... voila. 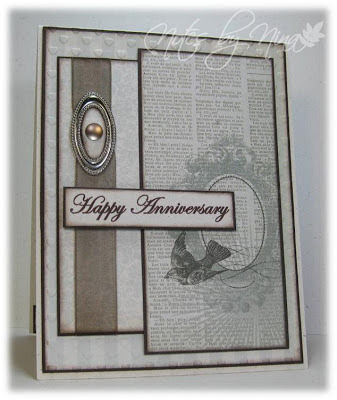 Supplies: Cream and grey card stock, Designer Paper & Stamps-Bo Bunny , Recollection Peals, Sizzlets little leaves, Spellbinders. I will be back tomorrow morning to share some comment love... night all. Happy Friday!! It is a long weekend for the Province of BC with our very first Family Day happening on Monday, I went one step further and took a vacation day for Tuesday as well. I am looking forward to 4 days of flying by the seat of my pants :) and relaxing. I am sure there will be a little crafting in there somewhere. We have a new Playing in Paradise Challenge this morning and Dawn is our hostess this week. 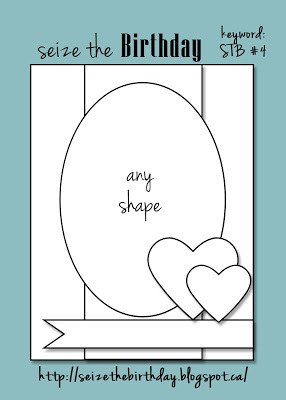 I made this clean and simple Valentine's for my sweet husband, one word says it all :). I let the DP do all the talking for this card. I used Sizziz embosslets for the hearts adding an inked edge, I randomly popped a couple of them up with foam tape. I finished with some twin and gems. 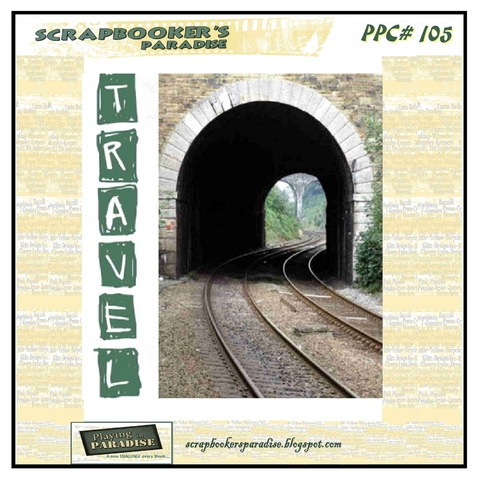 I know the ladies have created some fantastic project for this challenge and you can take a look at the Challenge Team creations HERE. 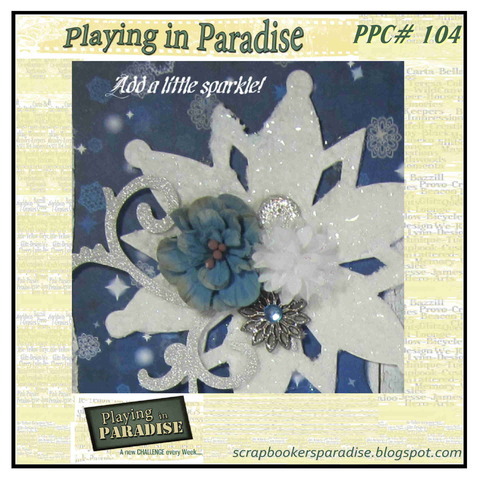 Be sure to leave a comment and play along with this weeks Playing in Paradise Challenge. 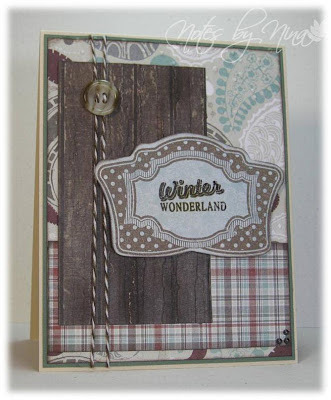 Supplies: Natural white and cranberry card stock, Designer Paper-My Mind’s Eye, twine, Recollection Gems, Sizzix embosslets. Thursday nights I have a running clinic so I wanted to find a challenge that I would be able to make a quick card between getting home from work and 'running' off to the clinic. I have seen this CAS(E) this sketch challenge making the rounds and wanted to give it a try. 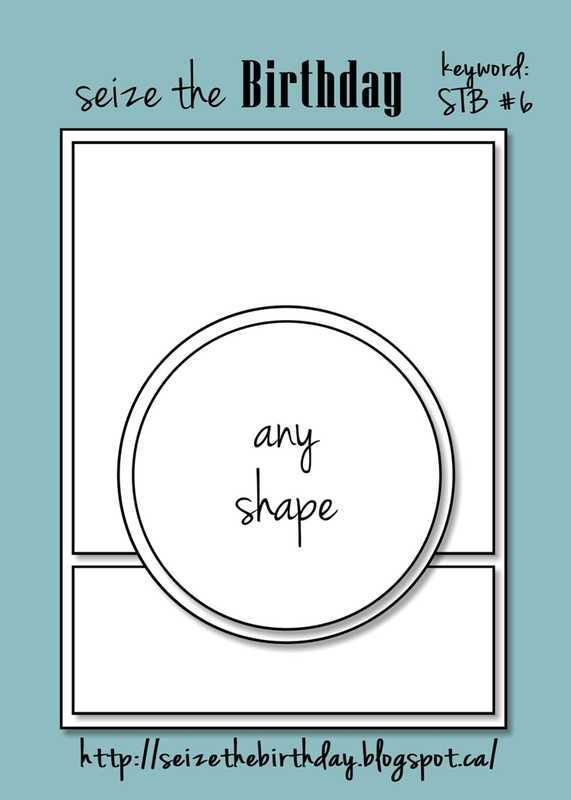 I made this card way more work than it need to be, I need to work on my clean and simple I think. 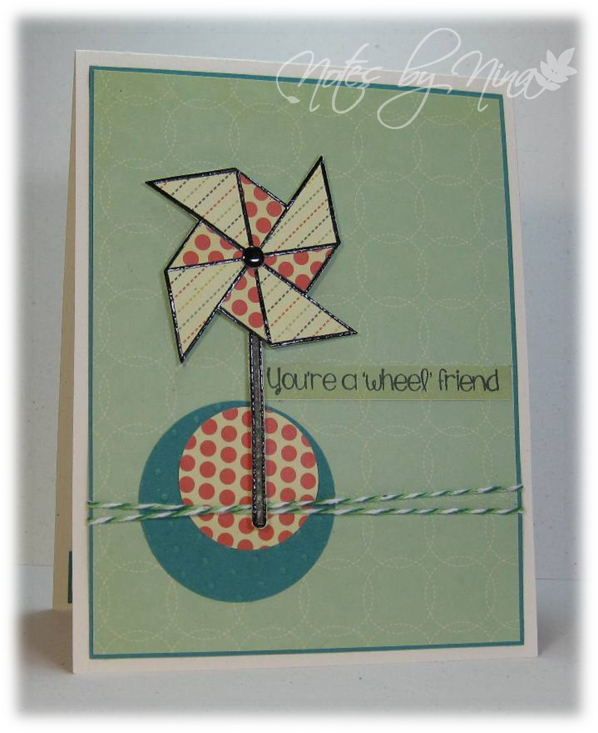 I stamped the pinwheel twice them pieced it together, it is popped up for foam tape. I finished with the sentiment and twine. 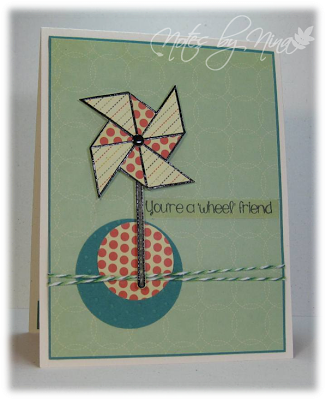 Supplies: Cream and turquoise card stock, Designer Paper-Cosmo Cricket, The Stamps of Life-pinwheels2stamp, twine, Hero Arts embellishments. Comments tomorrow, I think I might go in search of a icepack :). 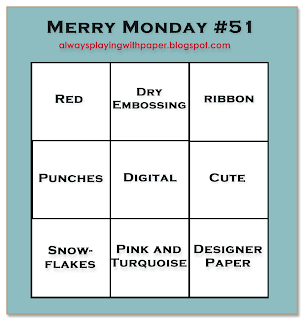 This is my second post of the morning, if you are looking for the Merry Monday Challenge please scroll down or click HERE . I have had this designer paper sitting on the edge of my desk for a couple weeks and just could not piece together a card in my head. The other day I found a sheet of cling stamps that I have not inked up yet and was determined to use one of them. Lo and behold they worked well together. 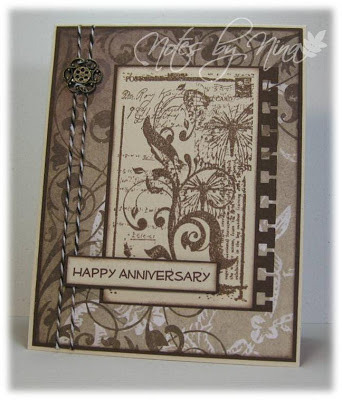 I used brown cardstock for the matt, stamped the image with Memento Rich Cocoa. The sentiment is printed from MS Word and popped up with foam tape. I finished with some twine and an embellishment that was really a charm that I used wire cutters to take off the sting loop. Supplies: Natural Ivory and brown card stock, Designer Paper -Unknown,Twine, and embellishment, misc punches. 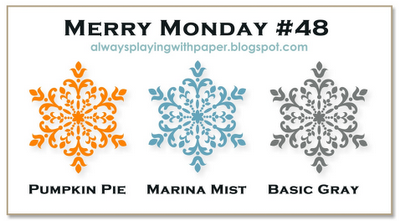 We have a brand new Merry Monday today, this week Lesley has a colour challenge for us. I ordered this DP online for the swirls and was not quite sure what I was going to do with the Nutcracker side when it arrived. When I saw the colours for this weeks challenge I was pretty excited. How can I not used these guys as the focal point, I added a vintage style greeting and finished with some twine and a old button from my stash. 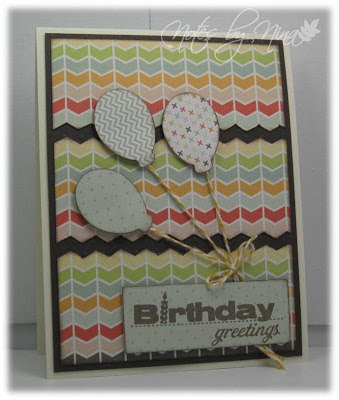 Supplies: Natural Ivory, yellow/orange and gray card stock, Designer Paper –Graphics 45, Stampendous-Seasons Greetings, twine, button. A quick second post for the current Seize the Birthday Sketch. This week the theme is a masculine card. 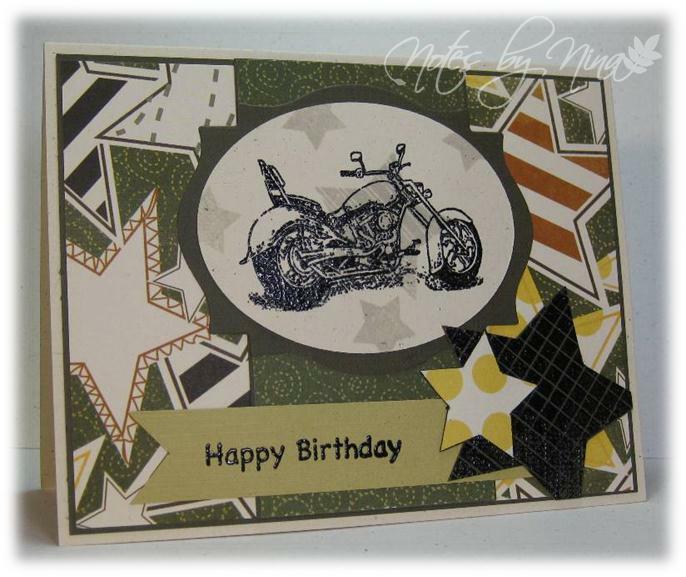 I heat embossed the stars and the motorcycle. I layered the background paper then added the focal image. I hand cut the stars and finished with the sentiment. Supplies: Natural Ivory and green card stock, Designer Paper-Bo Bunny, The Stamps of Life-Stars4you, HOTP-Tiny words, Stampin' Up!-Motorcycle, Spellbinders die cuts. Why do the weekends seem to zoom by so fast when a work week can feel like forever? It is Sunday already and I don't want to go back to work tomorrow :P. I did get to craft a little today so I am grateful. I am being a little lazy though and entering a single card for two challenges. I used the sketch from Tuesday Morning Sketches. 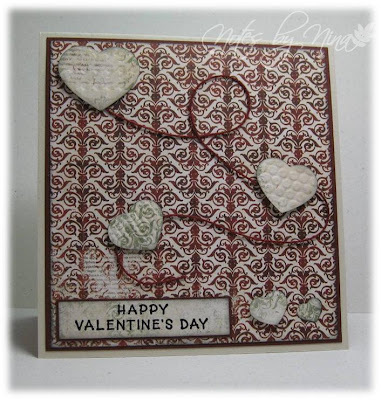 I used lots of layers and made great use of my Echo Park 6x6 Be Mine Paper pad.I stamped the image on DP and added a second layer to the heart and pot which are popped up with foam tape. 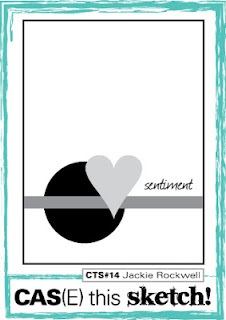 The sentiment is heat embossed with black and I finished with buttons and a heart gem. Supplies: Natural white. 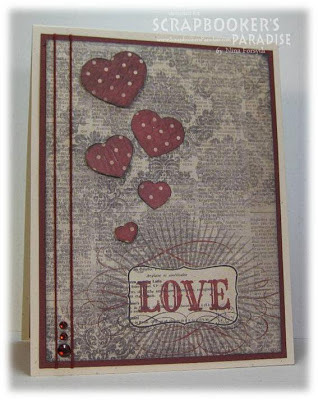 black and red card stock, Designer Paper -Echo Park, Inspired by Stamping-Sweet Valentine's and Hearts, Sizzix buttons, misc gems. I have put myself on a bit of a spending freeze when it comes to my craft supplies, I have tons and I really have not been making my way through my stash as I should. I could not resist taking a quick stop in Michael's today though, I still have a couple of gift cards left over from Christmas so I am cheating and saying it is really not spending :). Anyway, I found a couple of 6x6 My Mind's Eye paper pads that I wanted to play with. My In-laws have their 47th wedding anniversary coming up in a couple of weeks so I put together a card to pop in the mail. 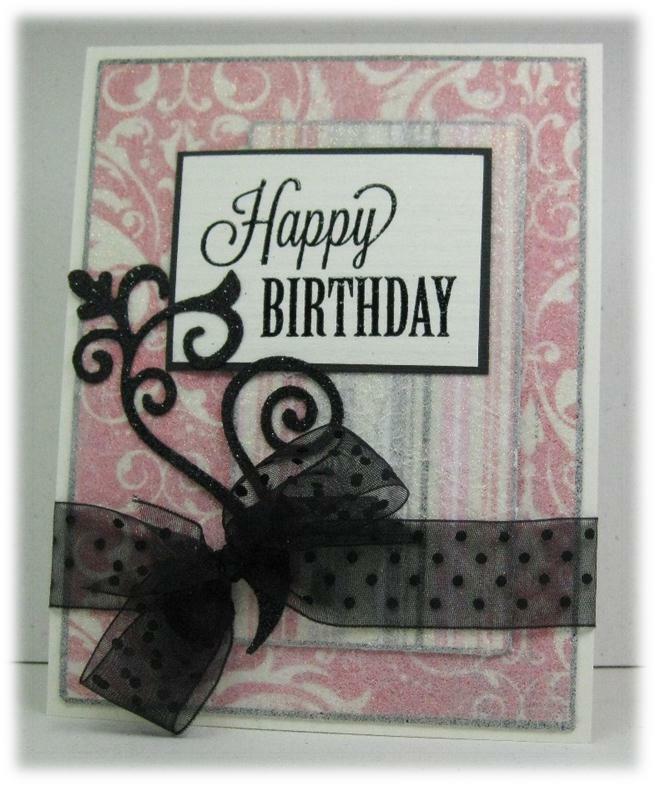 I used multiple layers and inked the edges, I added some ribbon and a ribbon glide. I cut a small insert for the ribbon glide to cover the backing and finished with the gem. The sentiment was printed from MS Word. Supplies: Natural white and brown card stock, Designer Paper -My Mind's Eye, ribbon. 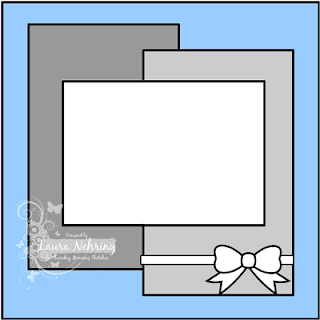 recollection gem, embossing folder, ribbon glide. Happy February 1st, it's Friday again, yahh :). Scrapbooker's Paradise has a new Playing in Paradise challenge this morning , Allison is our hostess this week with a sketch for us to play with. 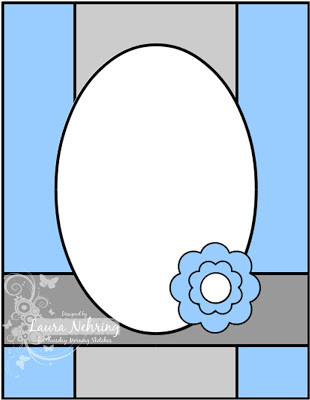 I went with a simple style for this card, this DP is so cute with the little birds. I added the center strip and used the folder tabs for a matte for the sentiments. I used a Sizzix die cut for the heart button and finished with twine. Please stop by the Playing in Paradise blog to see what the challenge team has created and we hope you play along. Supplies: Cream and brown card stock, Designer Paper-Simple Stories, Inspired by Stamping-Little phrases, twine, Sizzix button die cut, Folder tab punch.